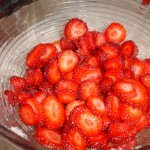 Add sugar to taste based on sweetness of the strawberries and about 3-4 tablespoons or less of Contreau for a pint of strawberries, this is optional. In Florida, strawberry season is not the same as the rest of the country. Florida’s strawberry season is in the spring. Walking through the produce aisle of the supermarket, I came upon a sale of fresh Florida strawberries, and they smelled delicious. Fact: if they don’t smell good they don’t taste good. A celebration was in the planning stage and of course it includes food. My nieces and their friends had helped my Mom move stuff from a warehouse. To thank them for spending their Saturday working instead of going to the beach, I invited them to dinner. I made asparagus with butter and garlic, lamb chops with a secret Chinese spice, and mashed potatoes. 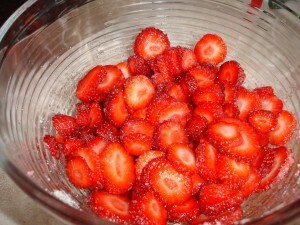 I had to use the strawberries for dessert, they smelled so good. 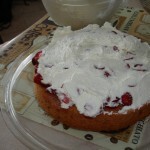 I searched the internet for strawberry shortcake, strawberry tart, strawberry anything and found a recipe that looked appetizing and changed it a little. 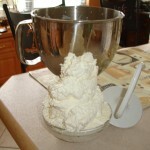 FOR CAKE: Sift together: flour, salt, and baking powder. In a separate bowl, combine butter, sugar, eggs, and vanilla. Beat for a total of 3 minutes, scrapping the sides of the bowl. 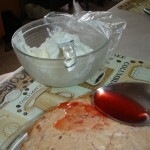 Then add flour mixture to creamed mixture, alternating with strawberries. Pour batter into two 8-inch round greased and floured cake pans. Bake in pre-heated oven for 25-30 minutes, or until cake tests done. Turn out on to wire cooling racks to cool. When cool, top with Strawberry Glaze. 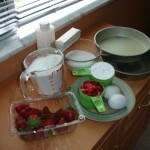 FOR STRAWBERRY GLAZE: Mix together all ingredients. 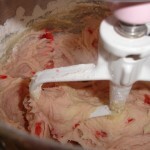 Use enough strawberries to thin mixture. In Tia’s version, I did not use the glaze. 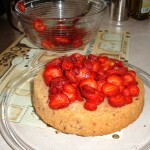 I cut up some fresh strawberries, added sugar and Contreau and used these strawberries to fill the cake. 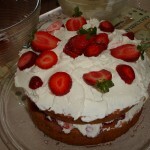 I also made a fresh whipped cream frosting to lighten the cake up. I like to lay out all the ingredients first. Beautiful color, matches the mixer! I think I underestimated the size of the bowl needed to hold the whipped cream. Gotta have the whipped cream! It may have been prettier without the whipped cream in the middle but it tasted good! Chris, Jackie, Noah, Alessio, Marcello and Katie, thanks for all your help. This entry was posted in Desserts, Fruits, Recipes. Bookmark the permalink. Nice blog. I love it! 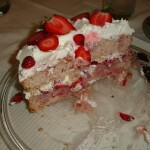 What a delicious start to your online presence – welcome to the blogosphere Ruth! I’m really looking forward to you adding more recipes and sharing your cooking adventures. Looks great Ruth. I can’t wait for strawberry season here. Plant City here we come. Can’t wait to try your cake!! Sorry you did not want to link up our blogs. I will be at IFBC in Santa Monica if you attend lets have coffee. Woah this blog is magnificent i love reading your posts. Keep up the great work! You recognize, lots of persons are searching around for this information, you could aid them greatly.